Home » Did You Remember to Change Your Smoke Detector Batteries? When you set your clocks forward Sunday did you check all your smoke detector batteries? If not, it is a good idea to take a look at your smoke detectors and ensure they have fresh batteries and are in good working order. A working smoke alarm significantly increases your chances of surviving a deadly fire. Here are a few tips on how to make sure your smoke detectors are ready to go this spring. Check the manufacture date of smoke alarms. All smoke alarms manufactured more than 10 years ago should be replaced as sensors in smoke alarms diminish over time. To check the manufacture date, remove the smoke alarm from the wall or ceiling and look for the printed manufacture date on the back. 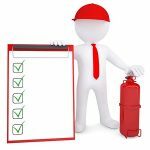 For those replacing smoke alarms, it is recommended that you use alarms with sealed, 10-year lithium batteries or, better, having all smoke alarms hard-wired and interconnected so when one sounds, they all sound. If the alarm chirps, replace only the battery. Date each unit when they are installed and replace them after ten years – or sooner if they don’t successfully pass the test by sounding the alarm when the Test button is pressed. But remember, smoke alarms are only one line of defense in fire safety systems. Another important preparation for people to make is to have a fire escape plan and a place for everyone to meet once they exit the building. A working smoke alarm significantly increases your chances of surviving a deadly fire. 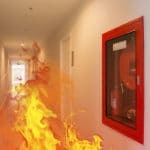 Remember to call Fire Control Systems for all of your fire system needs.